The Congregation of Trinity Church started meeting in the Log School House (L.S.H.) prior to 1877. Land on the corner of 2nd Concession and McCain Side Road was purchased in 1877 from Leonard and Mary Wigle for a cost of $5. A brick veneer Church was built facing the McCain with double doors in the front. Lighting was by coal oil lamps. 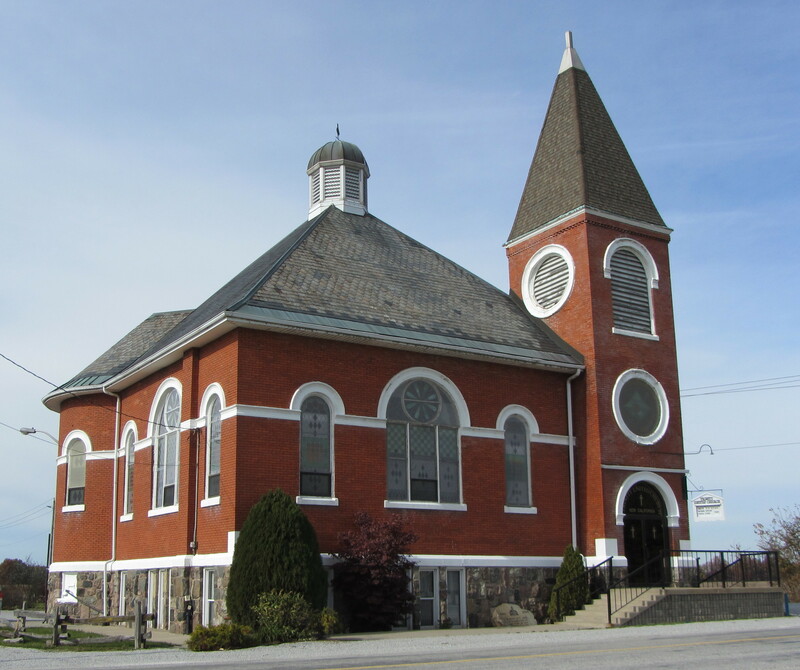 This Wesleyan Methodist Church was dedicated October 25, 1877. In 1906 the thriving community was named "New California" and a larger Church was needed. Construction of the Church building began April 1, 1906 with beautiful stained glass windows surrounding the Sanctuary. The bricks were engraved on the east side below the windows with names several names. To see the recorded names go to Trinity Bricks . The entrance for the Church included an arched window with the words: "ENTER INTO HIS GATES WITH THANKSGIVING". Trinity Methodist Church was dedicated by the Rev. R. C. Burton in October of 1906. In 1925 with the union of Methodist, Presbyterian and Congregational Churches it became Trinity United Church, New California. The stained glass windows in the Sanctuary were all rebuilt in 1991 & 1992. A parking lot and a garden at the back of the property were added in 1993. In 1993 a new front entrance was designed. 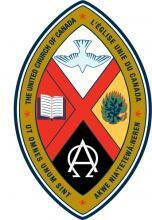 Glass doors now announce: "TRINITY UNITED CHURCH, NEW CALIFORNIA". In May of 2000 a storm blew off a portion of the roof and took off the cupola. The repairs were completed for the 124th Anniversary Service celebrated on October 28, 2001 with the Pastoral Minister, Linda Blair. painted this mural in memory of Fred Wright. 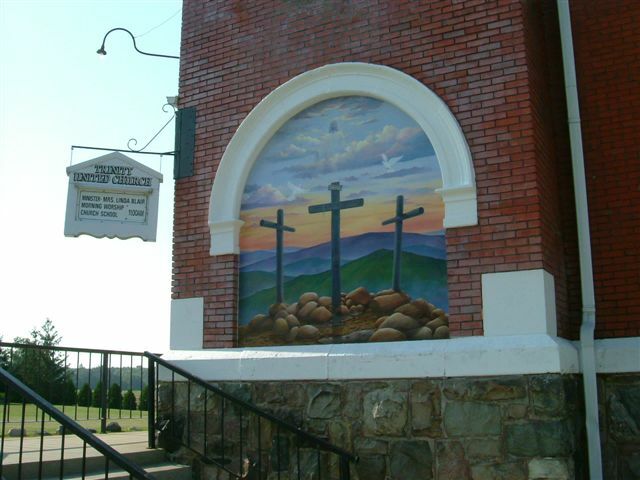 October 20-22, 2006 - Under the leadership of Margaret Pare, a Committee actively prepared for the 100th Year Anniversary of the present Church building. Invitations were sent to former members and flyers were prepared to distribute at the local Apple Festival Parade and Migration Festival Parade. Margaret along with Elaine Wright and countless others spent many hours preparing for this special weekend. Trinity along with Olinda-Ruthven welcomed our New Minister, Rev. Olav Kitchen on October 1, 2012. Trinity joined Olinda-Ruthven on Sunday, October 28, 2012 with a Celebration of a New Ministry along with Essex Presbytery to officialy start Olav's new Ministry with us. Sunday May 10, 2015 there was a Dedication at Trinity - for the Chair/Stair lift. The people of Trinity on Sundays now can get a lift.... a lift up the stairs! The goal is to make Trinity United Church accessible to the whole community. people to have access to both the sanctuary and the basement. We give thanks to those who made it happen and ask God to Bless it’s use.